Root Creek Falls and mighty Castle Dome. The Trinity Divide, the large mountain range directly to the west of Mount Shasta is a treasure trove for outdoor enthusiasts. Blessed with lakes, rivers and spectacular rocky cliffs, the range is also home to some fantastic waterfalls. Though none of the waterfalls in the Trinity Divide are as well-known as their cousins along the Sacramento and McCloud Rivers, they are still gorgeous cataracts. What sets the falls in the Trinity Divide apart from those in the river areas is the grand setting in which they are found. Specifically, the majority of the waterfalls in the Trinity Divide occur in the magnificent granite jumble of the Castle Crags. Just as the erosion resistant granite has contributed to the majestic waterfalls in Yosemite, it has also resulted in some memorable cataracts in the Crags. The biggest difference between the waterfalls in Yosemite and the Castle Crags is the formers vast watersheds that funnel tremendous amounts water over the falls. Though the Crags cataracts may lack volume they are still exquisite examples of plunging water. It is worth mentioning that while there are only a couple of named waterfalls in the Castle Crags, there are many, many more tucked away in the hidden folds of the Crags. Of course, the waterfalls in the Castle Crags are not the only ones in the Trinity Divide. During the thaw there are excellent cascades tumbling down the rocky cliffs that line the numerous cirques scattered around the Divide. Still, outside of the Castle Crags there is only one other named waterfall in the Trinity Divide. Faery Falls is a fine cataract tucked inside Ney Springs Canyon, just north of the Crags. Still, even if the falls of the Trinity Divide are focused in the Castle Crags, they remain some of the most spectacular waterfalls in Northern California and deserve far more attention than they receive. 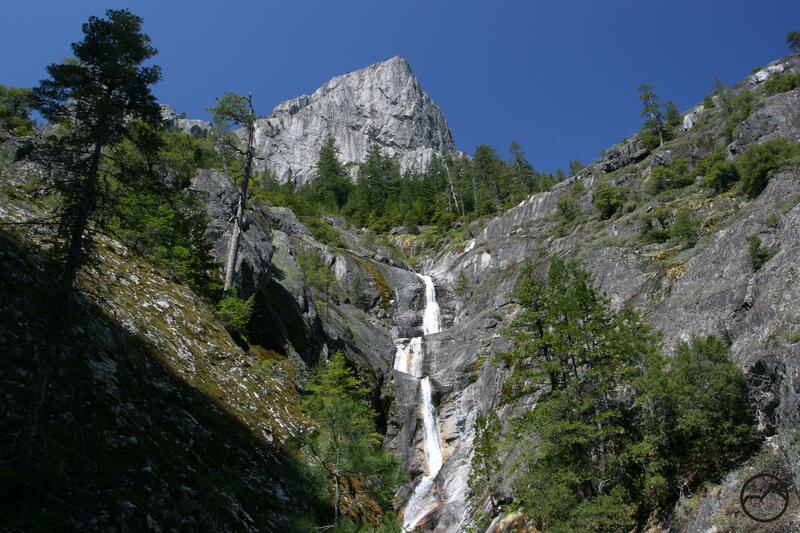 When folks talk about waterfalls in the Castle Crags, Burstarse Falls is naturally a subject of conversation. Yet the large waterfall’s lower sibling somehow fails to garner any mention in its own right. Lower Burstarse Falls (officially this falls has no name but this seems the logical choice) deserves better than this. Nearly 30 feet high, Burstarse Creek rockets itself over a short cliff and falls into classic pool at its base. In some ways it is reminiscent of the waterfalls found in the Appalachians: short, slender, graceful and beautiful. It is a fine sight, worthy of a hike in its own right. However, it is only a part of the greater whole since it must be passed en route to Burstarse Falls. In truth, it is one of many waterfalls that line Burstarse Creek below Burstarse Falls, though it is by far the largest and most obvious. Surprisingly, for all of its anonymity in the shadow of the larger waterfall, a surprising number of people go no further than this cataract, thinking they had found Burstarse Falls! 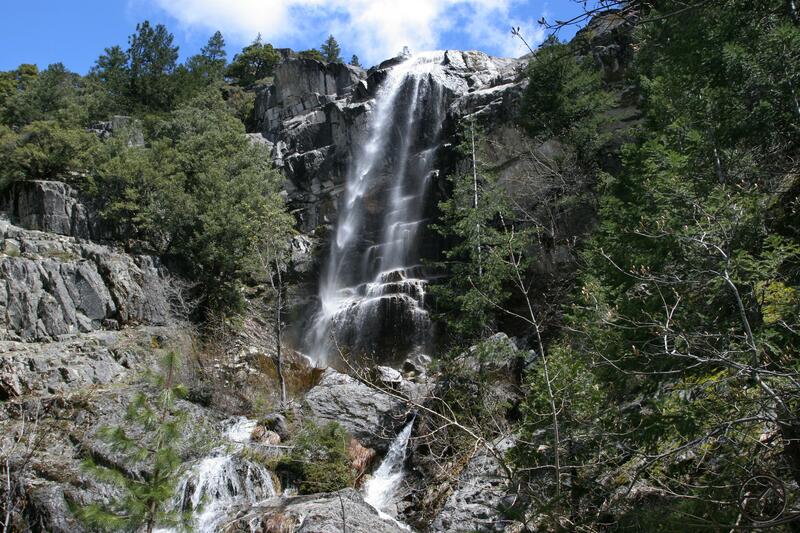 Hidden away in a narrow granite amphitheater, Burstarse Falls is one of the Castle Crags’ finest waterfalls. About 80 feet high, the falls are a slender, rainy cataract. Somehow, despite the seemingly slight nature of the falls they manage to retain a tremendous amount of power. 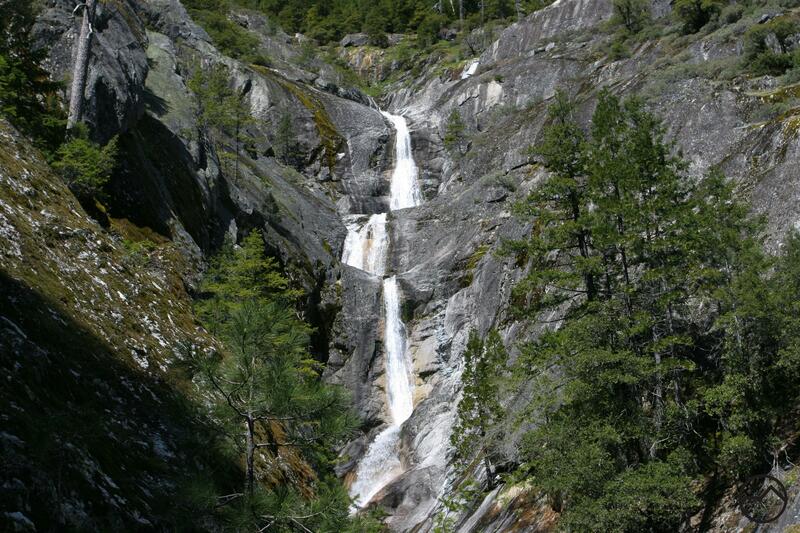 Formed when Burstarse Creek hurtles itself off of a tall granite cliff with great momentum. Rather than cascading down the cliff, Burstarse Falls is a complete free fall. This is what results in the rainy nature of the falls. About three-fourths of the way down the fall, the water crashes into a rocky bench and breaks apart into numerous cascades. There is a bit of a pool at the base of the falls but it is not a great one for soaking in. The tight confines of the amphitheater make viewing Burstarse Falls a more secluded, intimate experience. The cliffs looming so closely overhead magnifies the energy and ferocity of the waterfall. 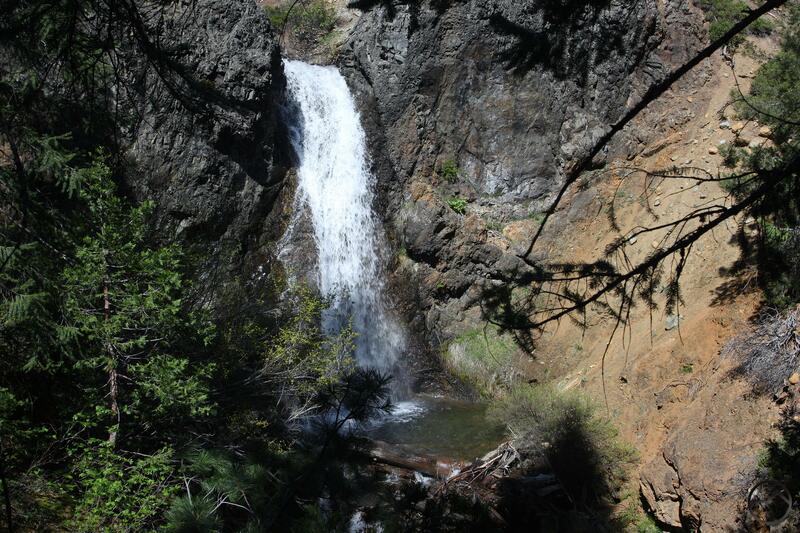 Coupled with the exciting scramble up the narrow canyon to the falls and the many fine cataracts along the way, the hike to Burstarse Falls is possibly the Mount Shasta area’s best spring hike. The route along the Pacific Crest Trail is low enough to be free of snow far earlier than most of the trails in the area. Of course, spring is the best time to view the falls because Burstarse Creek has a very limited watershed. Though it usually has a meager flow throughout the year, the spring thaw is the best time to see the falls at their full fury. Almost totally unknown beyond a few locals until a few years ago, Root Creek Falls still remains a fairly obscure waterfall. It does not get mentioned in any waterfall guidebooks nor does the Root Creek Trail garner a lot of attention. 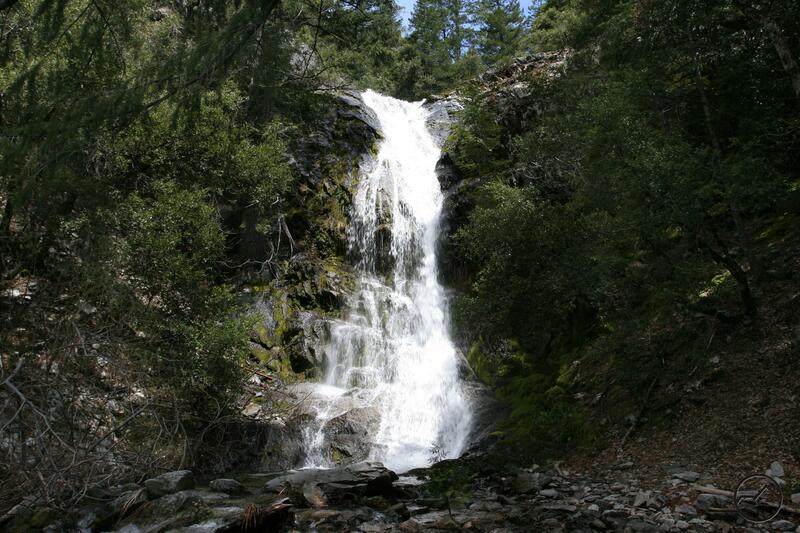 What is passed over though is one of the most spectacular waterfalls in Northern California. Like all the waterfalls in the Castle Crags, it does not have a high volume, instead taking on a graceful, wispy appearance. However, what Root Creek Falls lacks in power it makes up for in form and setting. Composed of a series of cataracts falling over five tiers, the falls charge through a narrow slot. This alone would make the falls a beautiful sight. What sets it apart and makes a truly magnificent waterfall is the presence of mighty Castle Dome looming high overhead. The polished granite dome seems to have been wrenched out of Yosemite and dropped into the Mount Shasta area. It completes a wondrous picture where dome and falls combine together to form what ought to be one of the most iconic images of the North State. Instead it remains largely anonymous, a favorite of locals who make the easy hike to the falls. For those looking for a bit more adventure, it is possible to scramble up to the waterfall and enjoy gorgeous sapphire pools that lie at the base of some of the tiers, again bringing to mind some of the spots in California’s most famous national park. A little further north from the Castle Crags, Ney Springs Creek begins at Little Castle Lake and races through a remote and wild canyon. The lowest portions of the canyon once hosted a thriving health resort in the 19th century. Closed long ago and reduced to ruins, it is hard to imagine the bustling activity that once surrounded the area. A series of springs give rise to the resort, which was located on the banks of Ney Springs Creek but a short distance up the canyon is beautiful Faery Falls. This was surely one of the great attractions of the resort and most have seen considerable visitation while it was in operation. Today the resort is gone and nature is reclaiming what little of it remains, yet Faery Falls flows as it always has. The falls are easily accessed on an old road that is, like the resort, slowly being taken over by the surrounding forest. 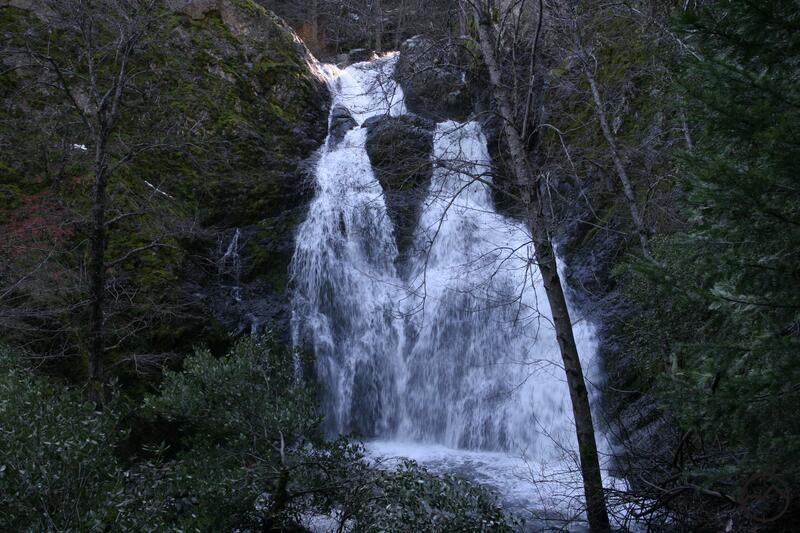 About 40 feet high, the waterfall is formed when the creek pours over a rocky cliff band that cuts across the canyon. A little higher up the canyon this band of cliffs is now a popular rock climbing spot. The cataract first falls through a short but very narrow slot. It then hits a broad, rocky bench and breaks apart into two large waterfalls. When the creek is full, it is a powerful sight, amplified by the tight canyon. When the water level is low, one of the two lower sections, typically the one on the left, disappears. Thankfully, given the lake and meadow that feed the creek in the high country, Faery Falls has a much longer season than its neighbors in the Castle Crags and can be enjoyed well into the summer. Rising from headwaters in remote Eddy Bowl on Mount Eddy, Wagon Creek is a large, beautiful creek. The northernmost tributary of the Sacramento River, it makes a precipitous descent down the east side of Mount Eddy, forming one of the most striking displays of white water in the Mount Shasta area. Wagon Creek Falls is a 50 foot plunge through a notch in a nearly vertical serpentine wall. It is perhaps the most classically formed waterfall in the region. However, it is by no means the only cataract on Wagon Creek. Several other notable falls and cascades are formed on the way down to Mills Meadow. Some of these, though not true waterfalls, are striking in their own right. The drawback to these beautiful cataracts is their remoteness. These are some of the hardest waterfalls to reach in the area and certainly the hardest to reach that are not on Mount Shasta itself. However, for those who make the journey out to Wagon Creek Falls, they will not be dissappointed! That’s a beautiful collection of waterfalls, and nicely photographed!